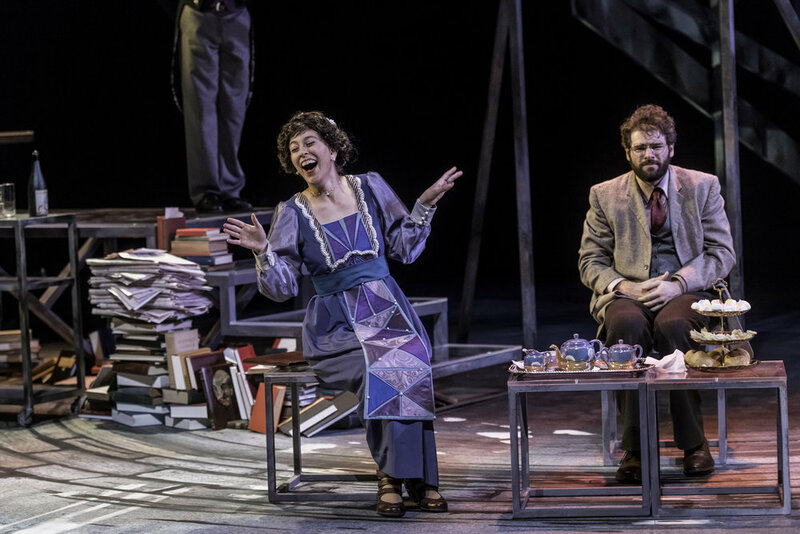 As Emilia, trying and failing to seduce husband Iago (Jordan Coughtry) with Desdemona's dropped handkerchief in Iago's Plot at Krannert Center for the Performing Arts. Conceived and directed by Shozo Sato. Written by Leslie Baker, Robert Clingan, Carl Freundel, and Robert Moor, and supervised by Juanita Rockwell. Choreography by Philip Johnston. Original music composition by Stephen Gawrit. Fight direction by Robin McFarquhar. Costume design by Olga Maslova. Lighting design by David Krupla. Sound design by Lorna Chavez. Properties by Julie Rundell. Hair and makeup by Sharné van Ryneveld and Shozo Sato. Vocal coaching by Susan Schuld and Adam Thatcher. Technical direction by Dylan Kind. Stage manager Nick Loweree. Photo credit Darrell Hoemann. April 2017. 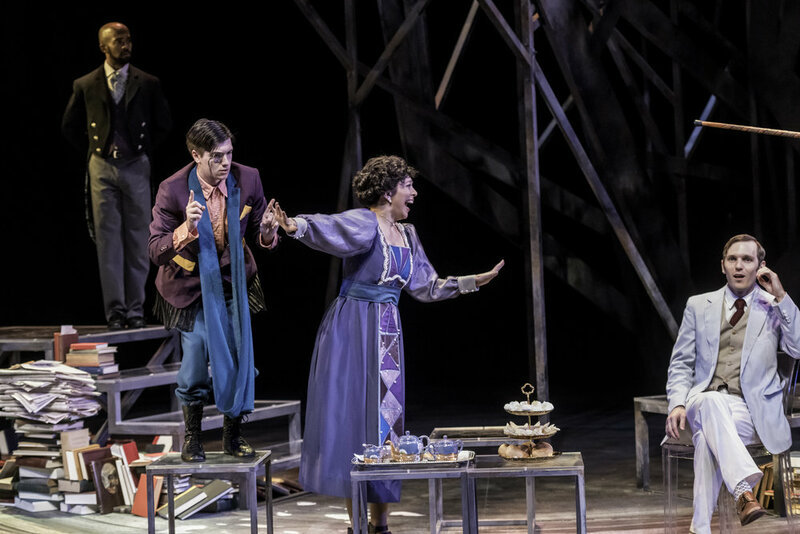 As Emilia, trying and failing to help save Desdemona (Elana Weiner-Kaplow) in Iago's Plot (with Kevin Blair as Cassio in the background) at Krannert Center for the Performing Arts. Conceived and directed by Shozo Sato. Written by Leslie Baker, Robert Clingan, Carl Freundel, and Robert Moor, and supervised by Juanita Rockwell. Choreography by Philip Johnston. Original music composition by Stephen Gawrit. Fight direction by Robin McFarquhar. Costume design by Olga Maslova. Lighting design by David Krupla. Sound design by Lorna Chavez. Properties by Julie Rundell. Hair and makeup by Sharné van Ryneveld and Shozo Sato. Vocal coaching by Susan Schuld and Adam Thatcher. Technical direction by Dylan Kind. Stage manager Nick Loweree. Photo credit Darrell Hoemann. April 2017. As Emilia in Iago's Plot at Krannert Center for the Performing Arts. Conceived and directed by Shozo Sato. Written by Leslie Baker, Robert Clingan, Carl Freundel, and Robert Moor, and supervised by Juanita Rockwell. Choreography by Philip Johnston. Original music composition by Stephen Gawrit. Fight direction by Robin McFarquhar. Costume design by Olga Maslova. Lighting design by David Krupla. Sound design by Lorna Chavez. Properties by Julie Rundell. Hair and makeup by Sharné van Ryneveld and Shozo Sato. Vocal coaching by Susan Schuld and Adam Thatcher. Technical direction by Dylan Kind. Stage manager Nick Loweree. Photo credit Darrell Hoemann. April 2017. Swimming across Lake Michigan as Jenny June Fail in Failure: A Love Story at Krannert Center for the Performing Arts. Written by Philip Dawkins. Directed by J.W. Morrissette. Music supervision by Justin M. Brauer. Scenic design by Evan Park. Costume design by Nicole Zausmer (look at that tutu! the lake is attached to me!). Lighting design by Michelle Benda (this lighting design moment pictured here was so gorgeous). Sound design by Tyler Knowles. Properties design by Kira Lyon. Dramaturgy by Kelsey Fenske. Technical direction by Roy H. Howington. Stage manager Marissa Gainey. Photo by Darrell Hoemann. February 2017. Full of sass as Jenny June Fail in Failure: A Love Story at Krannert Center for the Performing Arts. Written by Philip Dawkins. Directed by J.W. Morrissette. Music supervision by Justin M. Brauer. Scenic design by Evan Park (look at that gorgeous clock hanging from the ceiling!). Costume design by Nicole Zausmer. Lighting design by Michelle Benda. Sound design by Tyler Knowles. Properties design by Kira Lyon. Dramaturgy by Kelsey Fenske. Technical direction by Roy H. Howington. Stage manager Marissa Gainey. Photo by Darrell Hoemann. February 2017. Taking my swimming training very seriously as Jenny June Fail in Failure: A Love Story at Krannert Center for the Performing Arts. Written by Philip Dawkins. Directed by J.W. Morrissette. Music supervision by Justin M. Brauer. Scenic design by Evan Park. Costume design by Nicole Zausmer. Lighting design by Michelle Benda. Sound design by Tyler Knowles. Properties design by Kira Lyon. Dramaturgy by Kelsey Fenske. Technical direction by Roy H. Howington. Stage manager Marissa Gainey. Photo by Darrell Hoemann. February 2017. As Marge Simpson in the third act of Mr. Burns, a post-electric play at Krannert Center for the Performing Arts. With Ellen Magee as Lisa Simpson (and Allie Wessel as Marge Simpson in the background). Written by Anne Washburn. Directed by Lisa Gaye Dixon. Choreography by Aaron R. White. Music direction by Cara Chowning. Scenic design by Jaclyn Zimmerman. Costume design by Nicole Zausmer. Lighting design by Michael Shoaf. Sound design by Tyler Stewart Knowles. Technical direction by Robert Jenista. Stage manager Chenglin Xin. Photo by Darrell Hoemann. October 2016. As Colleen in the first act of Mr. Burns, a post-electric play at Krannert Center for the Performing Arts. Written by Anne Washburn. Directed by Lisa Gaye Dixon. Choreography by Aaron R. White. Music direction by Cara Chowning. Scenic design by Jaclyn Zimmerman. Costume design by Nicole Zausmer. Lighting design by Michael Shoaf. Sound design by Tyler Stewart Knowles. Technical direction by Robert Jenista. Stage manager Chenglin Xin. Photo by Darrell Hoemann. October 2016. As Miriam in Kingdom City by Sheri Wilner (with Allie Wessel as Crystal). Direction by JW Morrissette, set by Jane Siebold, lighting by Alon Stotter, costumes by Pingwei Li, props by Corey Campbell. Photo by Darrell Hoemann Photography. February 2016. With the ladies of Easy Abby season two, directed by Wendy Jo Carlton. L to R: Shannon Noll, me, Tuckie White, Tamale Sepp and Keight Lane. January 2016. Shooting season two of You're So Talented, created/written/directed by Sam Bailey. Talking through a shot with DP Mateo Gonzalez and actors Ashleigh Lathrop and Gabriel James Franken. August 2015. On set as Jessica Jones with Patrick de Nicola as Batman as Sam Andrew Martin, dir., frames the shot. DateSMASH! episode 2 - Jessica Jones and Batman in "Pillow Talk," produced by XVP Comedy. February 2016. Photo credit: Braden Moran, 2013. Photo credit: Jazmin Corona Photography, 2012. Photo credit: Jazmin Corona Photography, 2013. Photo credit: Jazmin Corona Photography, 2011. As Lizzie MacKay in Aguijón Theater's The Respectful Prostitute. Dir. Sándor Menéndez. Spring 2014. As Lizzie MacKay in Aguijón Theater's The Respectful Prostitute. With Ramón Smith. Dir. Sándor Menéndez. Spring 2014. As Lizzie MacKay in Aguijón Theater's The Respectful Prostitute. With Sándor Menéndez. Dir. Sándor Menéndez. Spring 2014. With Ernesto Melchor and Marcopolo Soto as a trio of kidnappers in Los Carralejas by Raúl Dorantes, dir. Carlos Jaime. Colectivo El Pozo, spring 2012. 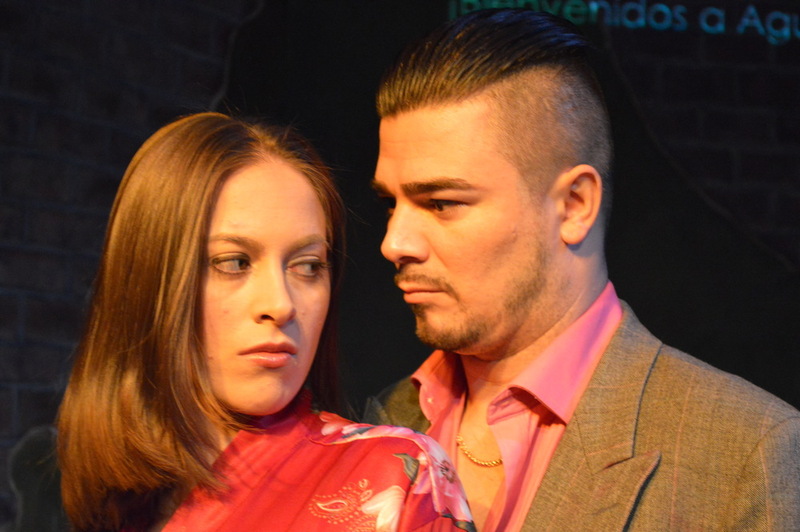 With Marcela Muñoz as Irene in Aguijón Theater's La Pasión Según Antígona Pérez, spring 2011. With Rey Andújar as the chorus in Aguijón Theater's La Pasión Según Antígona Pérez, spring 2011. "4.5 Rooms of Jorge Luis Borges," a performance installation by Seth Bockley. The University of Chicago, spring 2010. On set in San Lorenzo, Honduras, script supervising Isle of Fortune, directed by J. Monty Nyahy. With Jason Friedman-Mendez (L) and Kellye Janel Diaz (center), spring 2009. Script supervising in paradise. Isle of Fortune, directed by J. Monty Nyahy. San Lorenzo, Honduras, spring 2009. 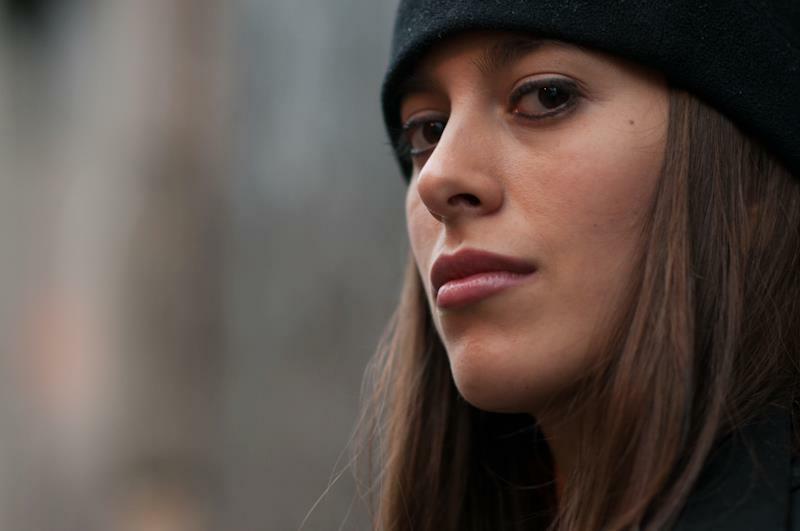 Abigail in Absent Father, directed by Douglas Chang. Boston, spring 2006.